CCF's Mission: To ensure the long-term survival of the cheetah and its ecosystem through a multi-disciplined and integrated conservation program of research, management & education. Founded in 1990, the Cheetah Conservation Fund (CCF)'s mission is to be an internationally recognised centre of excellence in research and education on cheetahs and their eco-systems, working with all stakeholders to achieve best practice in the conservation and management of the world's cheetahs. As Namibia has the largest and healthiest population of cheetahs left in the world, CCF's International Research and Education Centre is based in Namibia, near Otjiwarongo. 1. Conducting intensive scientific research and publishing papers on research findings--in cheetah genetics, biology, ecology, health and reproduction, human impact, and species survival, including assistance with the management of captive and free-ranging cheetah throughout the world. 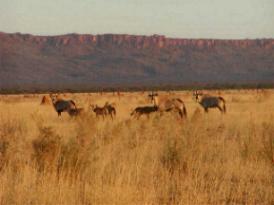 CCF also develops and implements non-lethal predator control and other better livestock management practices. These include CCF's Livestock Guarding Dog Programme, and the relocation of problem cheetahs, which attempt to eliminate the need for ranchers to kill cheetah. 2. Creating and managing long-term conservation strategies for the cheetah throughout their range. CCF researchers develop, test, and promote alternative land-management practices such as conservancy development, and eco-tourism. 3. Carrying out local and international conservation education programs to illustrate ways in which the species can be protected, by addressing community upliftment and predator-conflict resolution. CCF also creates and disseminates education materials worldwide. 4. Building capacity in countries that still harbour cheetah populations. The international program currently includes distributing CCF materials, lending resources and support, and providing training throughout Africa and the rest of the world. CCF is a proactive organisation that finds practical solutions to help people to help the cheetah and this is reflected in the CCF Vision: "We see a world in which cheetahs live and flourish in co-existence with people and the environment". 22nd July 2000 marked an important time in CCF's history, as His Excellency Dr. Sam Nujoma, President of the Republic of Namibia and CCF's International Patron, dedicated the new Haas Family Cheetah Research Centre and the Carl and Cathryn Hilker Education Centre. This represented the culmination of two years of renovation. The Research Centre houses a veterinary clinic, laboratory and main offices. The Visitor's Centre includes a large meeting room, a small cafe and catering kitchen and gift shop. The Education Centre provides students and visitors the opportunity to learn more about the behaviour and biology of the cheetah and the Namibian ecosystem that supports Africa's most endangered cat species. All areas focus on a landscaped courtyard with native gardens. The centre of the courtyard includes a beautiful wire frame cheetah sculpture donated by Amy Malouf, former Round River Conservation Studies student. The dedication of CCF's Research and Education Centre also marked CCF's 10 year anniversary of active in-situ cheetah conservation in Namibia. CCF has been actively changing humanity's understanding and learned negative behaviours towards predators for over ten years. 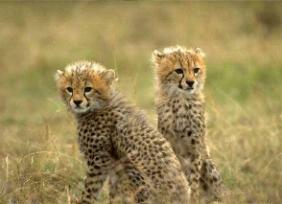 Namibia has the greatest potential of maintaining a habitat and prey base for the cheetah. With the assistance from 'cheetah friends' throughout the world, Namibia has become proud of being the "Cheetah Capital of the World". Education Centre Traces the Cheetah Story - And So Can You! The graphics in the new Education Centre bring the visitor through the history of the cheetah from pre-history to current time and show the diminished range. A phylogenetic tree shows where the cheetah, different from the other 36 cat species, first branched from its early relatives, 4 million years ago. The cheetah’s biology is highlighted in an extensive series of descriptive panels, while exhibits show how the cheetah is adapted for a high-speed sprint and its specialised hunting techniques. 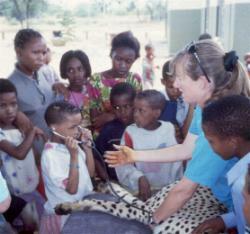 The visitor is taken through the life cycle of the cheetah from birth to adulthood and the difficulties involved in its struggle for survival. A life-size playtree has been built with an explanation of the importance of these trees in a cheetah territory. A capture cage is under the tree with graphics explaining how farmers live- trap cheetahs to remove them from their lands, and how detrimental this is to the species’ survival. You can study the display panels shown below by taking our Virtual Tour of the Education Centre - select the full Graphic Tour or the lower-bandwidth Text-based Tour by choosing a link from the list to the right. The Waterberg Plateau: 50 kilometres from Otjiwarongo, hidden in the heart of Namibia, the Waterberg Plateau rises 300 metres from the plains, providing a natural haven for wildlife. Several land owners have formed a group to protect this unspoiled and magical region. Each ranch offers a variety of activities for the visitor, from safari game drives and wilderness trails, to cheetah viewing and visits to local Herero villages. Or you can simply relax and enjoy a cocktail, watching a classic African sunset. This timeless region is an ideal 'stepping stone' between Windhoek and Etosha National Park, the wilderness of Kaokofeld, tiger fishing on the Okavango River, or the spectacular dunes of the coast. But beware, the Waterberg has a mystical quality - You may never want to leave! Visiting CCF Namibia: CCF's focus is on research, conservation and education. An extensive modern Visitor and Education Centre encourages visitors to learn about cheetahs, their habitat and issues of conservation, with an opportunity to see resident non-releasable cheetahs, acting as 'cheetah ambassadors' for the species. A stop over at CCF makes a very worthwhile, enjoyable and informative visit for the tourist. CCF is open daily from 9am-5pm. Staff are available to show visitors around the Education Centre and CCF's facilities. Visitors can also observe cheetahs being fed (most afternoons except Sundays around 2.30pm, and at noon on Saturdays), and meet staff who will show them around the centre and answer questions. There is a small gift shop, which sells cool drinks, and a verandah overlooking the Waterberg Plateau with tables and chairs where people can rest and/or eat their own picnic lunches. The large modern Education Centre houses a museum that provides visitors and students the opportunity to learn more about the behaviour and biology of the cheetah, and the Namibian ecosystem that supports Africa's most endangered cat species. The excellent graphics and interactive displays in the centre bring the visitor through the history of the cheetah from pre-history to modern times, and explain how their range and numbers have diminished. Other exhibits show where the cheetah fits into the cat species family tree, how the cheetah differs from the 36 other cat species, how the cheetah is adapted for a high speed sprint and its specialised hunting techniques, and finally, the cheetah's life-cycle from cub to adult. A life-size 'playtree' shows the importance of these trees in a cheetah's territory. Continuing through the Education Centre, the visitor can learn about other aspects of conservation and the work of CCF: for example, how the cheetah lives within an ecosystem together with prey, and how farmers can live with cheetahs on their land by using non-lethal predator control methods, a prime example being the use of Anatolian Livestock Guarding Dogs from Turkey. CCF has been promoting the use of these dogs since 1994, breeding and donating them to Namibian farmers to guard their flocks. Finally, a Future Room highlights the need for continued research so that humans and nature can live together. The Research Centre houses a veterinary clinic, laboratory and main offices. The Visitor's Centre has a large meeting room, gift shop, verandah and the predator preyground' outside is a learning area for school groups and children of all ages. Enjoy the view of the Waterberg Plateau from the verandah, and relax in the landscaped courtyard with native gardens and an attractive sculpture of a cheetah. Location: CCF is situated 44Km from Otjiwarongo on the D2440 (drive north on the B1 towards Tsumeb or Otavi; as you leave Otjiwarongo there is a brown sign to CCF; take this road right and follow it to CCF; it takes about 45 minutes driving from Otjiwarongo). We are about 3.5 hours drive from Windhoek; we are also 3.5 hours from the Namutoni gate and 2.5 hours from Okaukuejo gate in Etosha. history of the cheetah, from pre-history to current time, and show its diminished range.